What are the procedures for registration, import certification, import customs clearance etc to import to India from Tanzania? How to import from Tanzania to India? What is the step by step way to bringing in goods to India? How to import to India? Let us discuss here about the process of importing to India from Tanzania. You may discuss about how to import to India from Tanzania at the end of this post at discussion forum. Main Indian imports from Tanzania include gold dore, cashew nuts, pulses, timber, spices (mainly cloves), ores and metal scrap, gemstones, etc. 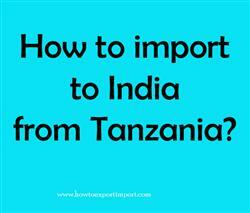 This piece of information explains on how to import to India from Tanzania. You may add below your views on importation of goods from Tanzania to India. Waseeq: On 12 February 2019 How would I verified that Tanzania company is registered and genuine?